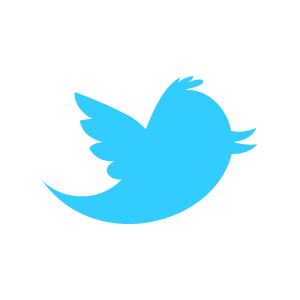 Color has the indisputable ability to transmute emotion and express your persona in ways almost no other medium can. When vivid color is integrated into fashion, it can animate your presence and emotions in ways that make you absolutely glow with allure. 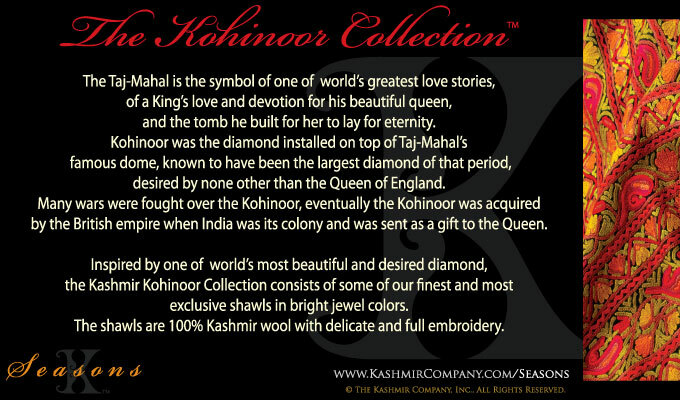 This amazing power is harnessed in the Kohinoor Shawl Collection by The Kashmir Company. Passionate jewel-like colors and hand-embroidered excellence are the pillars behind one of our most refined assortments of authentic Kashmir shawls ever! These stunningly colored one-of-a-kind designer shawls stimulate the emotional senses unlike perhaps anything you’ve ever worn. Each handmade shawl from this collection is made of 100% Kashmir Wool and embellished with precision embroidery that varies between delicate to robust. Vibrant, impactful color was our motivation for piecing together this matchless assortment of 100% Kashmiri Wool, designer shawls. However, the story behind this fierce authentic Kashmiri shawl collection has a much deeper, more profound message. The Kohinoor Designer Shawl Collection is inspired by one of the greatest love stories of all time. This is the story of a King’s love for his Queen, who after giving birth to their fourteenth child, died; forever breaking the heart of her widowed monarch. After experiencing tremendous grief for the loss of his true love, the King built the famed Taj Mahal to immortalize his love for her. At the peak of this architectural spectacle once rested the Kohinoor Diamond; the most sought-after and largest jewel of its time. While the Kohinoor Diamond would eventually be captured by the British Empire; the jewel’s shimmering colors will always symbolize the undying emotions that a King deeply felt about his one true love. When you enhance yourself with one of our dynamically colored, hand-embroidered Kashmiri Wool shawls from the Kohinoor Collection; you’re making a statement to the world. Wearing a designer shawl from the Kashmir Company is expressing your confidence and immutable character by animating your emotions with these Kohinoor Jewel-like colors and patterns. Nothing says mad love like adorning a handmade Kashmiri artisan shawl for the world to feel absolutely seduced by. And men… nothing says I love you like presenting your soul mate with an authentic Kashmir shawl from the Kohinoor Collection. While you may not be able to build her another Taj Mahal, you can choose the right colors, patterns and designs that perfectly express to her your infinite love.